I’m in a season of choosing my “Yeses” wisely. In fact, the summer is nearly over, our son goes off to collage in just a few weeks and I’ve watched days turn to weeks, turn to months and those moments are slipping by. I don’t like it one bit because I feel as if I’ve let some intentional moments slip by in a hurry. So I am saying “yes” to building community and going deeper with my kids and “no” to the things that won’t make a difference one year from now. I’m hosting a gathering of friends this week. Those are the moments that I cherish: catching up, sharing life, acknowledging that life can be messy, yet we are all in this together. There’s freedom in just putting your expectations out there. So, we’re having a play date lunch/going away party potluck. Everyone is pitching in on bringing the food and I went into “15 minute party planning mode.” I want things to be special, but acknowledge when I can’t do it all. It’s amazing what you can do when you shop the house for a few minutes. 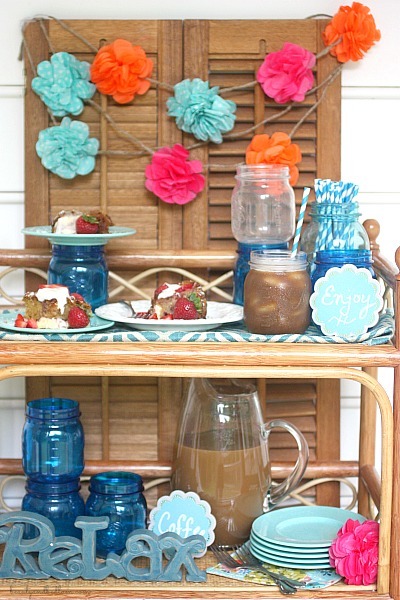 I pulled together a thrift store shutter find, a tiny yard sale shelf that I still haven’t painted turquoise, some cute fabric and mason jars to create a fun and festive little Iced Coffee and Brunch Bar. It took me barely any time, yet added that extra element without any stress. Remember, it doesn’t have to be perfect to be beautiful, just invite them and share life together. I set the thrifted shelf right on a desk that is waiting patiently for me to paint (yes, it’s out on my porch) and it adds such a fun welcome for my guests. 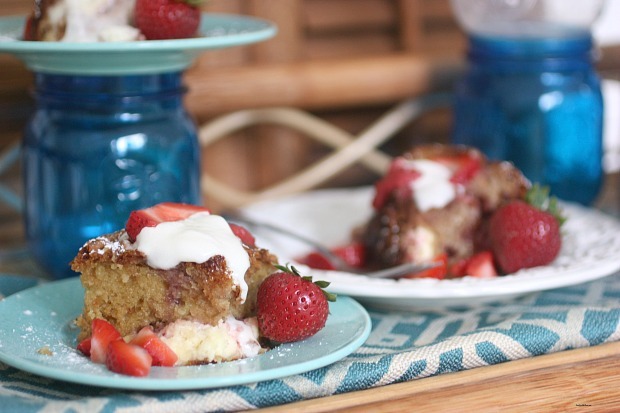 I whipped up this delicious Strawberry Blintz Coffee Cake and paired it with my favorite International delight Iced Coffee and now I have a party ready in just a few minutes. 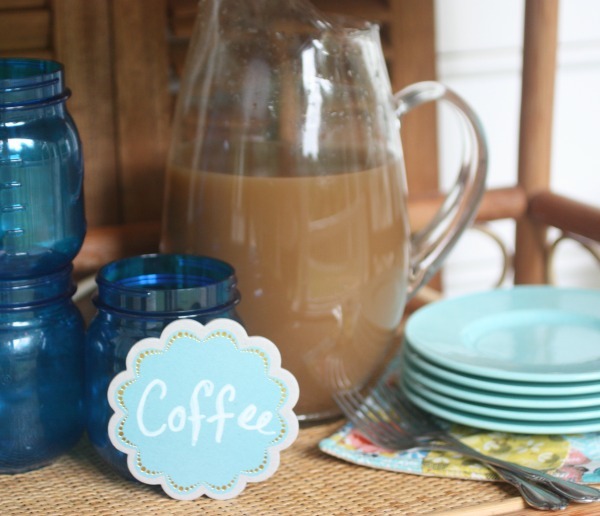 The Target Dollar Spot is one of my favorite places to browse and stock up on easy party planning additions. The cute, blue coasters were 4/$1 and I used a Chalk Board Marker to label them. I use these ALL THE TIME!! You can get such clean lines as opposed to chalk. 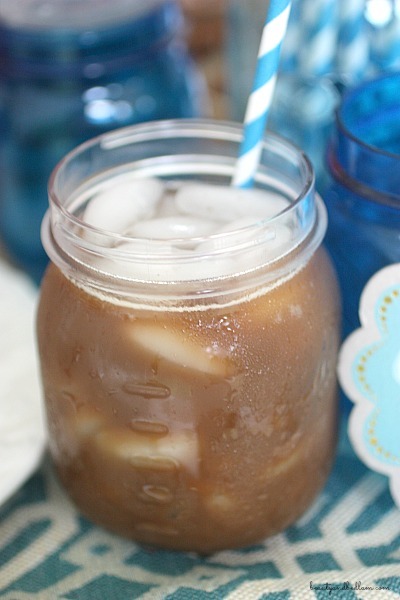 One of the tips I’ve learned with my love of Iced Coffee is to avoid regular ice cubes if you are serving over a period of time. 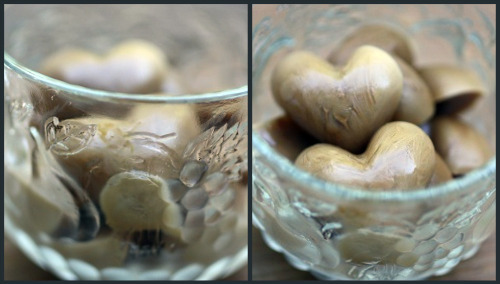 It’s so easy to freeze coffee in cute shaped ice trays like my heart ones, and then use them to keep the drinks cold. In doing this, you avoid any watered down affect and keep the delicious coffee flavor at its premium. The light Mocha flavor is by far my favorite and my “Go to” in the refreshing drinks department. 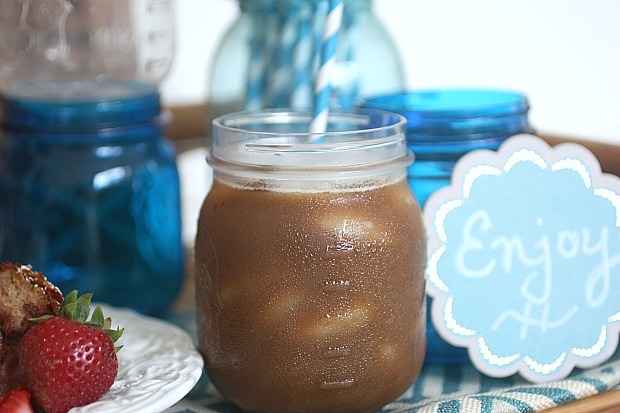 With none of the guilt of a high calorie drink, I love to pour myself a cup and sit on our porch. It’s my alone time moments and I cherish them. I got addicted to it last year when we served it to our guests at the Becoming Conference. I enjoy welcoming people into our home and it’s so wonderful to know that often, it’s just about extending an invitation, making them feel welcome and using what you have to make a festive environment. 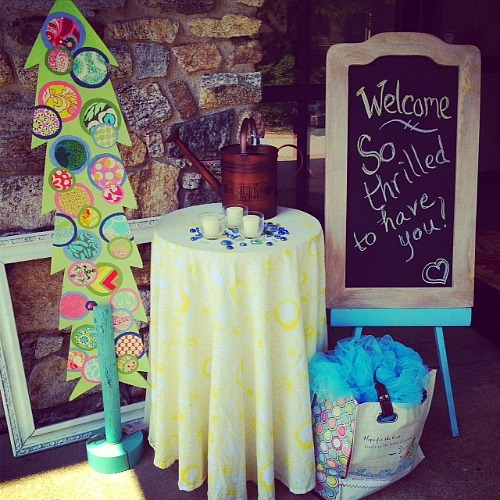 What are some of your favorite quick and party planning ideas? I’d love to hear them. You are a woman after my own heart. Simplicity is my new goal in life. All the fuss just isn’t worth the exhaustion of trying to make everything be perfect. I have noticed that my guests seem more comfortable when they know I didn’t have to work really hard to impress them. That cake looks delicious and the heart ice cubes are so cute. Thanks for the reminder that the people are more important than the party favors!